(Nanowerk News) Over the course of the last half century, BPA has gone from miracle to menace. Its popularity soared after the 1950s, when scientists discovered that it could be used to make polycarbonate plastic -- a hard, durable, and transparent material perfect for everything from water bottles to medical devices. But recently, that soaring success has soured: a growing body of evidence suggests that even low doses of BPA might be harmful to human and environmental health. It's classified as an endocrine disrupting compound, a substance that can derail the body's hormone balance and potentially cause cancer or birth defects. Many manufacturers are phasing BPA out of their products, particularly storage containers used for food and beverages, but it's still a huge industry. Furthermore, BPA doesn't break down easily, making it hard to safely dispose of the material. If it leeches into waterways, it may persist as an environmental toxin. Now, researchers have developed a new hybrid photocatalyst that can break down BPA using visible light. Their findings, published this week in the journal APL Materials ("Reduced graphene oxide and Ag wrapped TiO2 photocatalyst for enhanced visible light photocatalysis"), from AIP Publishing, could eventually be used to treat water supplies and to more safely dispose of BPA and materials like it. 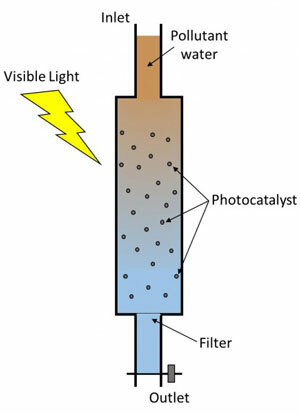 The photocatalytic nanomaterial can be used to treat water using visible light. Their new material breaks down BPA through photocatalytic oxidation, a process in which light activates an oxidizing chemical reaction. When light strikes a photocatalyst like titanium dioxide (TiO2) nanoparticles, the jolt of energy can kick one of its electrons up to an excited state and create a charge distribution imbalance. At the higher-energy electron band, there's now an excess of negative charge due to the addition of an electron. Meanwhile, at the lower-energy electron band, there's an excess of positive charge (known as a "hole") because an electron has left. In this excited, unbalanced state, TiO2 can catalyze oxidation and reduction of materials around it. The excited electron will have a tendency to leave the TiO2 to reduce something nearby, while the hole will help another substance to oxidize by accepting one of its electrons. However, pure TiO2 has a large bandgap -- that is, it takes a great deal of energy to excite electrons from one level to another -- and only displays photocatalytic properties under ultraviolet light. Plus, the excited electron tends to quickly fall back down and recombine with the hole, giving the catalyst little time in its excited state to induce a reaction. In order to turn TiO2 nanoparticles into a better photocatalyst, the researchers made several modifications. First, they added silver to the surface of the nanoparticles, a common technique to enhance the charge separation. When light strikes TiO2 and excites one of its electrons, the silver will pull that electron away so that it can't fall back down into the hole. The hole can then more readily assist in an oxidation reaction. The addition of silver also shifted the wavelength at which the photocatalyst became excited by inducing localized surface plasmon resonance effects --a phenomenon in which energetic electrons at the surface of a material vibrate at a specific frequency and enhance light absorption over a narrow range of wavelengths. In this case, the silver shifted the wavelength of light necessary to activate the photocatalyst towards the visible light spectrum. "The inclusion of a noble metal [like silver] in the ultraviolet-responsive TiO2 has significantly extended the spectrum towards the visible light through localized surface plasmon resonance effects," said Pichiah Saravanan, a researcher from University of Malaya who lead the project. Then, they wrapped the Ag/TiO2 nanoparticles in sheets of reduced graphene oxide (RGO), a thin layer of carbon atoms arranged in a honeycomb pattern. Like the silver, the addition of RGO helped the hole to persist by accepting excited electrons from TiO2. It also reduced the nanoparticles' bandgap, decreasing the amount of energy necessary to activate the photocatalyst. When the researchers mixed the hybrid nanoparticles with BPA solution under an artificial visible light source, they found that BPA oxidized and broke down much more effectively than it did without the catalyst present. Furthermore, the RGO-Ag-TiO2 nanoparticles outperformed those where RGO or Ag alone were added to the TiO2, suggesting that both modifications played a role in the enhanced catalytic activity under visible light. Eventually, the team hopes to use their findings to help break down BPA and other contaminants in water supplies. "We strongly feel the developed nano-photocatalyst could be one of the nanomaterials that can sustainably address said problem," said Saravanan.